The best part of any makeover show is the reveal. After all of the hard work and bumps along the way, we finally get to see the finished product. As local jewelry repair experts, we get to experience this great moment everyday. We see jewelry that’s taken all kinds of abuse. Earrings that have been flattened by car tires, engagement rings that have done battle with the garbage disposal, pendants that have been soaked in every household chemical known to man, and more have all crossed our doors. And, the best part of our day comes when we get to reveal this jewelry after it’s been repaired, reconditioned, and restored to its owner. 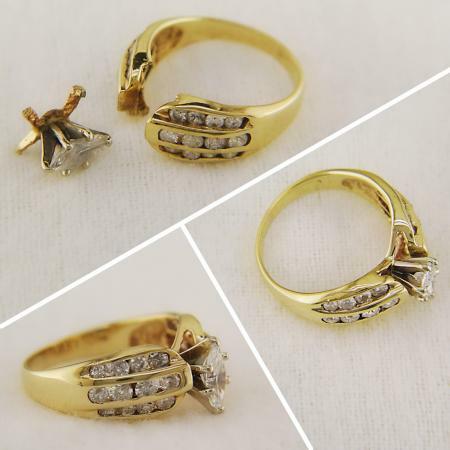 We wanted to share some of this excitement with our website visitors, and so we have started a before and after area on our jewelry repair page. There you can see examples of jewelry that came in battered and broken and left shining like new. We hope you enjoy seeing the restorations as much as we do, and if you have a piece that you might like us to restore, please feel free to contact us for a no obligation repair estimate.